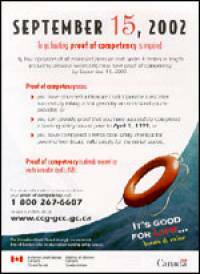 The CCGA and the Office of Boating Safety are combining their efforts with the launch of an information campaign to get the message out and to encourage compliance with the new pleasure craft regulations. 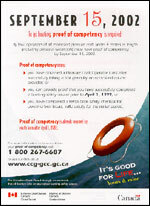 CCGA members play an important role in educating boaters and will encourage all recreational boaters to be aware of the new regulations. Each volunteer has received a factsheet with main messages they can use as well as a flyer with key elements on the regulations and compliance dates. A similar package has also been sent to marinas across Canada.